I went to Gamescom in Cologne this week and came back with almost 300 photos from the show. My first snip of coverage of the event is a collection of some of the boothbabes and game characters I spotted at the fair. My coverage starts with the Razer "Get Imba" press event, at this presentation the company revealed the Razer Naga mouse for MMO gamers and the Megasoma mousemat. The first three shots were taken before the company introduced the two new products, the models were doing a little act before they unveiled the Naga and Megasoma. The following two photos were taken on Thursday, the first day that Gamescom was open to the general public. 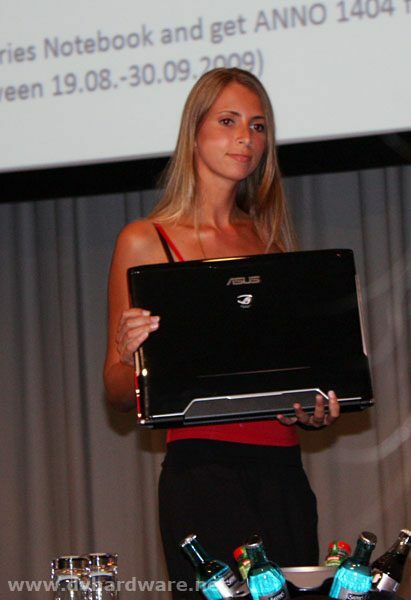 And by the end of the presentation they showed the box of the ASUS MARS, a limited edition graphics card with a price tag of 1,099EUR! Only 1,000 models were made of this card, and model 2 of 1,000 was showcased at the ESL Intel ASUs gamezone at Gamescom. The ASUS R.O.G. MARS features two GeForce GTX 285 GPUs, 4GB DDR3 memory, 1024-bit memory interface, 648MHz cores, 1476MHz shaders, 2304MHz memory, 2x DVI (HDCP) and HDMI. ASUS claims this is the fastest graphics card in the world, and the first consumer graphics card with 4GB memory.